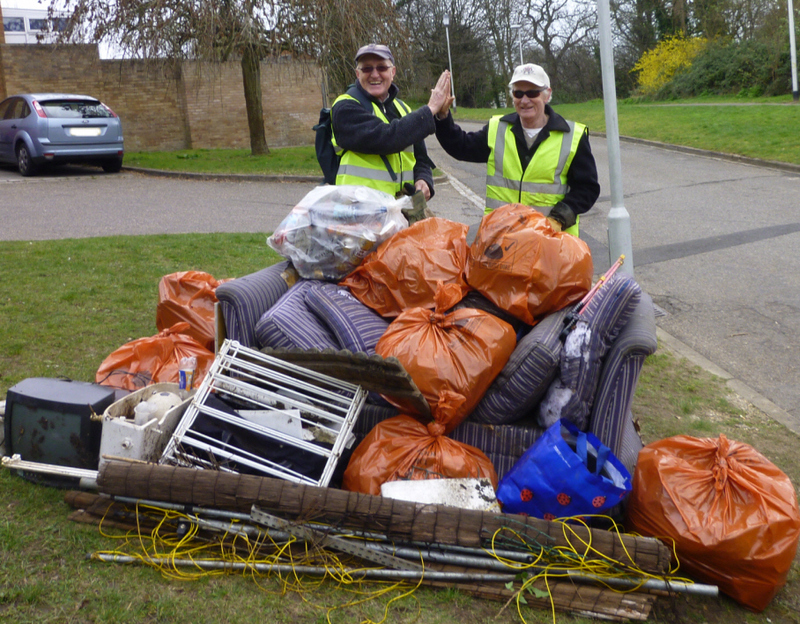 From the 9th to 11th March there was a force of volunteers enjoying the sunshine while litter picking all over Reading making Reading’s public areas a better environment for all. A total of 30 community and business teams gave up their time to remove unsightly and sometimes hazardous rubbish from some of Readings beautiful natural and highly used communual spots. All in all roughly 4 tonnes of rubbish was cleared from nearly 2 Million m2 of public space in Reading. Reading Borough Council’s parks, street care, street cleansing and sustainability teams worked in partnership with the volunteers to clear the rubbish away. Volunteers said they enjoyed the camaraderie of clearing up and feel they made an important difference in a short space of time. Now Reading residents and visitors to Reading can all enjoy the natural spaces free of litter. Thames Water once again sponsored the event as well as supplying a team of 40 volunteers to pick up litter along the River Thames. Organisers have so far totalled up 200 volunteers taking part contributing a total of 500 volunteer hours. A short video showing what RESCUE does can be viewed here. Our second Autumn clear up took place from 11th to 13th October. Over 200 volunteers endured intermittent rain to clear 16 sites across Reading. Two of our business teams were visited by the BBC who covered the event on the BBC Radio Berkshire and BBC South Today. New organisations who took part were ORH Consultancy, who had their entire company out, Caversham Park Village Residents Association joined Caversham Globe to increase the coverage of the event north of the River Thames, Kyocera Document Solutions who worked near their offices in South Reading, and freshers from Wantage Hall at the University of Reading. Please click here to see an article on Get Reading about what we did last October.